It was a hot, muggy afternoon in Southern Maryland. Temperature hovered around the upper 80s, with humidity playing a much bigger factor. Following the race, riders said they were able to deal with it, but they did notice the difference between the much cooler first six rounds. Just when it looked like Ryan Dungey was a beaten man--Ken Roczen had been slightly better all year but then really pulled away last weekend at RedBud--he bounced back. Roczen passed him in moto one but Dungey closed up late and pressed him to the end, and then the Dunge holeshot moto two and left everyone behind. Dungey pointed to major bike changes between last week and this as the reason. "I'd been making little changes, just clickers here and there, then back at home we decided to make some big changes," he explained. It worked. Dungey now has three-straight wins at the track but he doesn't believe there's anything special for him there, it's just worked out in his favor. Roczen on the other end wasn't dominant like he was at RedBud, and admitted on the podium that he just wasn't feeling it in the second moto. Despite seeing an end to his two-moto overall win streak, he was quick to carry the same attitude forward. He's still happy, still excited, still having fun and still can't wait to get to the next race. "I've always been that way," he explained after the race. "Try not to take it too serious, and just have fun racing." So does this mean Dungey gained a step, or did he just have a good track for his style, or Roczen maybe had an off day? Next week could serve as a real test, since it's Dungey's home track in Minnesota. A win there for Roczen could prove huge, but Dungey could end up leaving there with legitimate momentum for the second half. Blake Baggett went El Chupacrabra on the field in moto two. He was too far back in moto one to make it happen--he was a close third--but in moto two he got to second and went off after leader Jeremy Martin and hunted him down. He pulled away from the field immediately. “Yeah it’s nice outside. Nice and sweaty," he said of the weather. "I don’t mind the heat, and I think it makes for good racing.” Baggett, like Dungey, has also won three straight here but doesn’t think this track is anything special for him. Martin, then, like Roczen, wasn't down on the solid second for the day. "Compared to supercross and not qualifying for races, this is great," he said in the post-race press conference with a smile. Martin said he watched tapes from last year's race and new Baggett would be good here. Now he's got the home race coming up in Minnesota. It'll be pivotal for both of the Minny riders in the championship hunt. We finally have a new moto winner! Jason Anderson was agressive all day at Budds, leading in practice times all morning in both sessions until Christophe Pourcel pulled his usual trick and snagged the Oakley Bomb fast time on the very last lap. Anderson gated well in moto one--first time in awhile--battled past Justin Bogle and took off. Unfortunately he said the heat and humidty got to him, and Martin and Baggett closed in hard late. Anderson held on for the win but didn't have the same energy for moto two, and finished sixth. Still good enough for a podium. "I had never led an outdoor lap in my life, and that was a good feeling," he said. "Those other two closed in on me at the end so I was definitely stressing out a little bit. I got into lappers and maybe I paniced a little bit. When the two lap card came out I knew I could wing it and hold it pinned and hopefully hang on." How improbable was Eli Tomac’s podium at Budds Creek? He almost didn’t ride due to a nagging back injury. “Honsetly, at the start of the day I didn’t even know if I was going to race,” he said in a team statement. “To turn it into a podium is awesome.” Tomac has been nothing short of spectacular since his return, and has many wondering how long it will take to get his first 450 win. At Budds, starts were not his friend (Eli has gated pretty well so far outdoors on a 450 until today) but he showed real speed coming through. A week after being a scratch for the second moto at RedBud—following a crash in moto one—Soaring Eagle RCH Suzuki’s Weston Peick was in form at Budds Creek. Peick was finally nailing down his starts and used the good fortune to power to a fifth overall. Peick’s fifth in the second moto gave him four on the year—a career high. Honda Muscle Milk’s Fredrik Noren was more comfortable following his first week of testing with the team. After a tenth in moto one, Noren was running as high as eighth in moto two before crashing back to outside the top twenty. 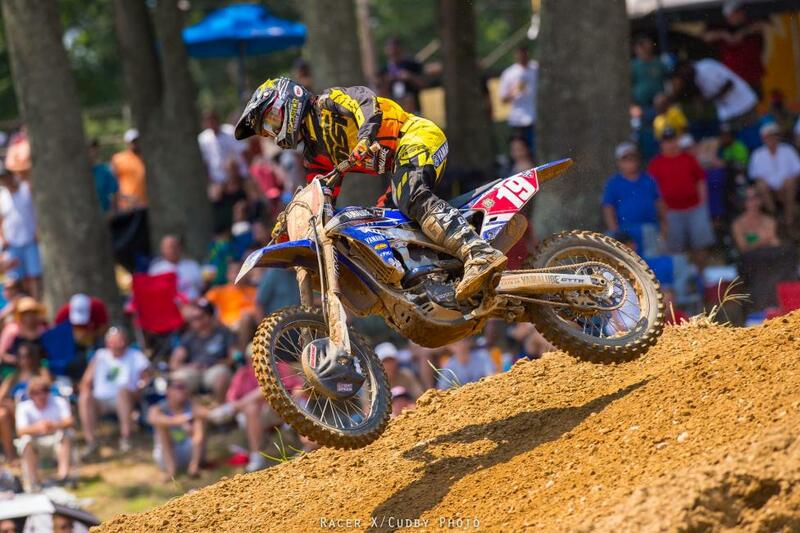 He was able to gain a couple spots late in the moto to finish sixteenth to give him twelfth overall on the day. Budds Creek marked Christian Craig’s second race since coming out of retirement. Craig is expected to race two more with Millville up next. He finished fourteenth on the day. JGR/Toyota Yamaha’s Justin Brayton has quickly reinserted himself into the series. In just his third race back, Brayton grabbed the holeshot in moto one, but took a rock to the hand when Ken Roczen passed and struggle to 14th. Brayton said after the race he thought the hand my be broken, but confirmed everything checked out between motos, but it was difficult to hold on in moto two. Phil Nicoletti returned from a week's absence to finish ninth overall. Nicoletti told us after the race he will take the next few weeks off—he was only scheduled to race three outdoor races—and his final race would be Unadilla. When asked if he would do the JGR fill-in program again next season if asked, he stated he would. Another forgettable weekend for James Stewart. A bad start in moto one saw him fight through for fifth, getting in sight of a Canard/Tomac duel for third at the end. He was battling with the Honda duo again in moto two before crashing and bending up his bike. He pulled into the mechanic's area and didn't return to the track. We honestly don't know what to say about Chad Reed's day except it was terrible--he failed to score points in either moto. We'll try to learn more this week. Solid day for JGR's Josh Grant, who has been darned consistent all summer. He overcame a crash in moto one for ninth, then got a good start in moto two and took home sixth, good enough for sixth overall. GEICO Honda’s Justin Bogle is just waiting for everything to click. For the second week he lad—he finished sixth overall on the day—and told us after the race he feels he has the speed, he is just waiting for it all to come together. Jeremy Martin and Cooper Webb will deservedly garner most of the attention, but Yamalube/Star Racing Yamaha may have another weapon in their arsenal. In his third race back from a concussion suffered at Glen Helen, Anthony Rodriguez finished ninth overall, giving Star three riders inside the top ten overall. As for Webb, he wasn't on the same level as he was at RedBud and Muddy Creek, where he won motos. Fifth overall with a 5-4 isn't bad but he admitted he just "Wasn't feeling the flow" to the TV cameras at the end of the day. Baggett did slide past him for second in points. Red Bull KTM’s Marvin Musquin started a chain reaction in the second moto when he wasn’t able to make the tight hairpin first turn--it looked like he might have gotten hit by Kyle Peters, which set of a series of unfortunate events. 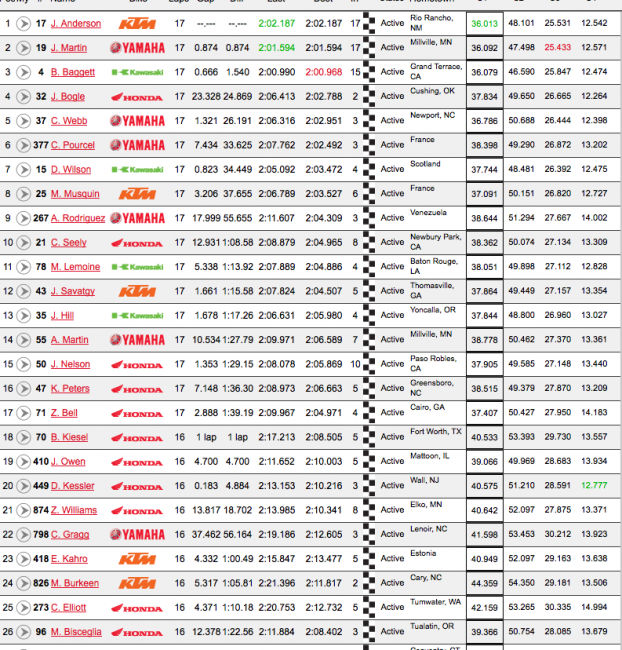 Musquin collected Joey Savatgy, Cole Seely, and Peters, among others, in the crash. Musquin would charge back to finish the moto fourteenth. Blake Baggett likes the heat. Blake Baggett likes Budds Creek. Blake Baggett has now won three straight at Budds Creek, joining Steve Lamson ('94-'96), James Stewart ('02-'04) and Ryan Villopoto ('06-'08), as the only four riders in 125/250 history to three-peat. Did we mention Blake Baggett likes Budds Creek? Points leader Jeremy Martin made a claim for the overall early, pulling the holeshot in moto two. A big pileup ensued behind, gathering Musquin, Savatgy, Seely and Wilson, among others. 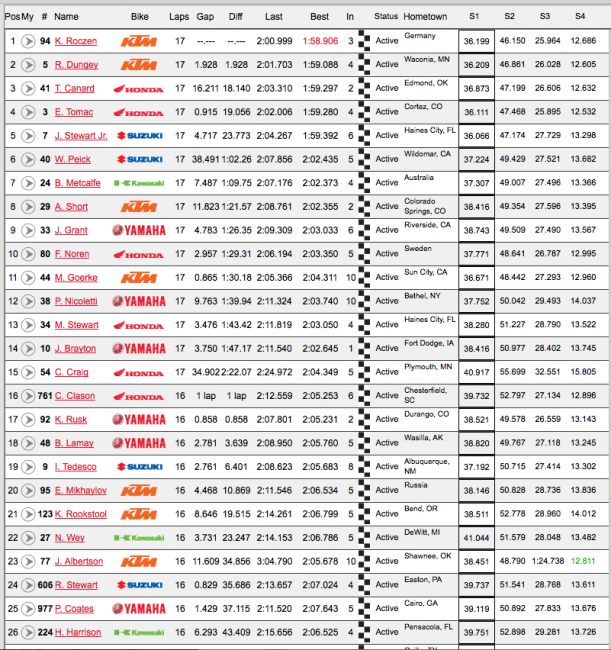 Musquin would finish fourteenth in the moto. It wasn’t that Baggett won the overall—we did mention he likes Budds Creek—it was how he did it. After slicing past Christophe Pourcel for second, Baggett was nearly six full seconds back of Martin. It wouldn’t matter much. He picked up the pace even more, cut the lead to within one around the six or seven minute mark and then blew past Martin in the rollers. He went on to win by more than fourteen seconds. Let’s repeat: fourteen seconds! Martin has to feel stunned, but can’t be too disappointed, as he only lost one point to Baggett and gained points on Cooper Webb. Pourcel, Webb, Justin Bogle, Justin Hill, Jason Anderson, Jessy Nelson, Cole Seely and Anthony Rodriguez would round out top ten. Ryan Dungey may have won the battle, but the war belonged to Ken Roczen. With just two moto wins entering Round 7, Dungey needed to get back on track in moto two, after falling nearly thirty points down to Roczen after a second earlier in the afternoon. And he did. Dungey lead start to finish to capture his third moto win and his second overall on the season. That was the good news for Dungey. The bad: He gained zero points and is still twenty-six back of Roczen with five rounds remaining. 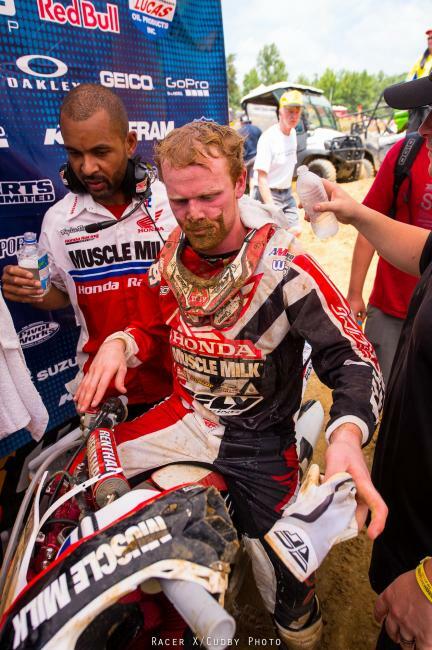 Trey Canard, James Stewart and Eli Tomac all held the final podium spot at one point. Canard and Stewart exchanged blows early, allowing Tomac to catch on the rear. Stewart looked to have the spot, and held it briefly, but Canard fought back to regain the position. Tomac eventually passed Stewart as well. Stewart went down late in the race and pulled out with bike problems. Tomac, at points, was the fastest guy on the track and almost cost Roczen points—making a late effort to catch Roczen for second. His valiant attempt fell short, but Tomac proved to be a wild card going forward. Canard and Weston Peick finished fourth and fifth, respectively. 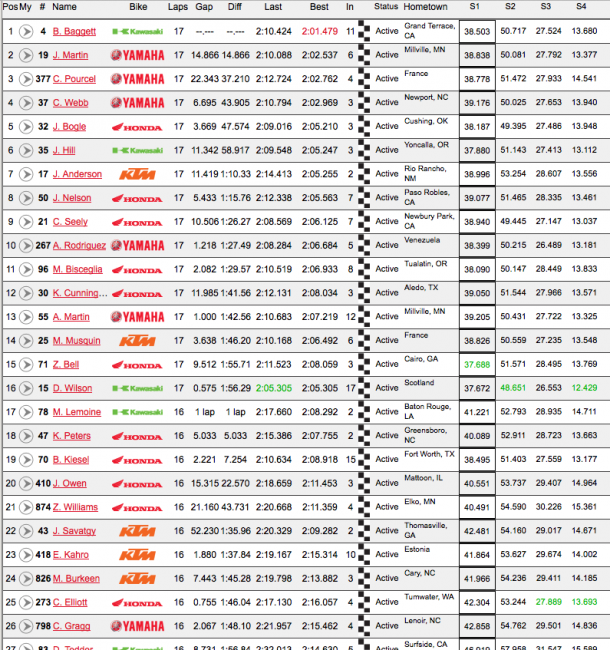 Josh Grant, Andrew Short, Phil Nicoletti, Justin Brayton and Matt Goerke would finish inside the top 10. Over the past few weeks, the younger crop of 250 riders—many of whom have never raced him—have spoken to the degree of difficulty in passing Christophe Pourcel. With impeccable line choices, Pourcel makes you work. He makes you go where you don’t want to go. Jeremy Martin found this out at Budds Creek. GEICO Honda’s Justin Bogle clipped Pourcel to garner the holeshot. After Rockstar Energy KTM’s Jason Anderson moved past Pourcel, Martin would go on the attack. Pourcel, meanwhile, would go on the defensive—pushing Martin wide at every point he could. Up front, Anderson had moved past Bogle and opened a more than five second gap on Bogle and Martin. When Martin finally forced his way past Pourcel, he had seven seconds to shave off Anderson’s lead. He cut it to just over one with a lap to go. After a mad last lap dash by Martin, Anderson would squeak out his first career moto win by just over a second on Martin. Baggett—following an unfavorable start … again—would get to within a second of Martin on the final before finishing third. Pourcel wasn’t a factor at the front, but he may have played a role in determining the winner. Bogle, Cooper Webb, Pourcel, Dean Wilson, Marvin Musquin, Anthony Rodriguez and Cole Seely would round out top 10. In a little over half a season in 450MX, Ken Roczen has established himself as the heir apparent in the class. Today, on a track Ryan Dungey has won two of the last three, Roczen further supplanted himself. He now has a nearly thirty point lead on Dungey with eleven motos remaining. Toyota/JGR Yamaha’s Justin Brayton was the early leader ahead of teammate Phil Nicoletti and Honda Muscle Milk’s Trey Canard. With Dungey and Roczen lurking, Canard dashed to the front. 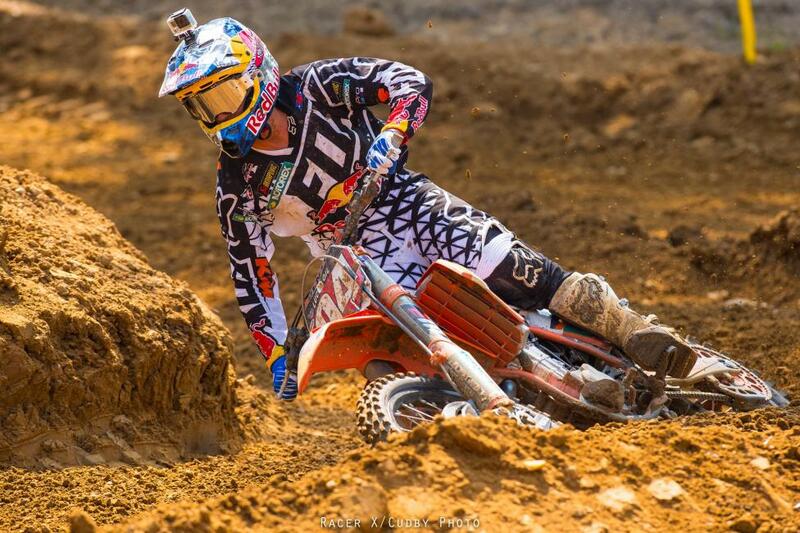 Muscling past Brayton, Canard was able to put another rider between himself and the KTM duo. Moments later Dungey was past as well, taking Roczen with him. An uncharacteristic mistake from Dungey opened the door for Roczen, who took full advantage. He stalked Canard briefly before pushing his way through to the lead. Dungey eventually followed suit, but it wasn’t enough as Roczen had already built a five second lead. Canard was able to hold off a late charge from Eli Tomac to capture the final podium spot. An unforgiving start for James Stewart lead to a fifth. Weston Peick, Brett Metcalfe, Andrew Short, Josh Grant and Fredrik Noren would cap the top ten. A thick cloud of humidity layered the Southern Maryland Budds Creek facility early this morning. The unrelenting heat as yet to let off, producing what is expected to be the first hot race of the season. Temperatures are expected to climb into the upper 80s at race time, with the humidity expected to cause bigger problems. For the 25th time in history, Lucas Oil Pro Motocross has traveled to Mechanicsville and there are not many changes to report in regards to the layout, but the dirt is expected to be a little more dry and hard pack than previous rounds. Following a 1-1 sweep at RedBud a week ago, Red Bull KTM’s Ken Roczen is twenty-six points clear of teammate Ryan Dungey. Carrying an average finish of 1.58, and just over 103 laps lead, the rookie from Germany has planted his stake in American motocross. At the mid-way mark, Roczen has lead 94 more laps than Dungey, who has just nine on the season. But it was Yoshimura Suzuki’s James Stewart leading the field after practice. 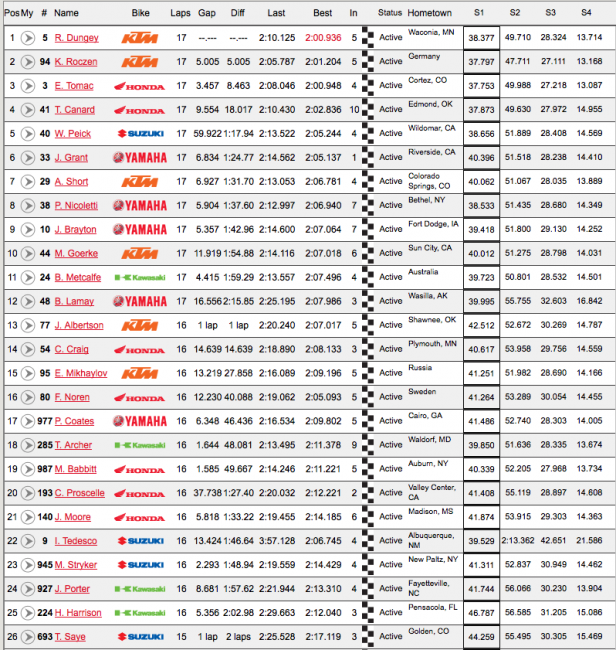 Stewart’s 1:57.748 in the first practice would hold up over Roczen’s 1:58.217 in practice two. 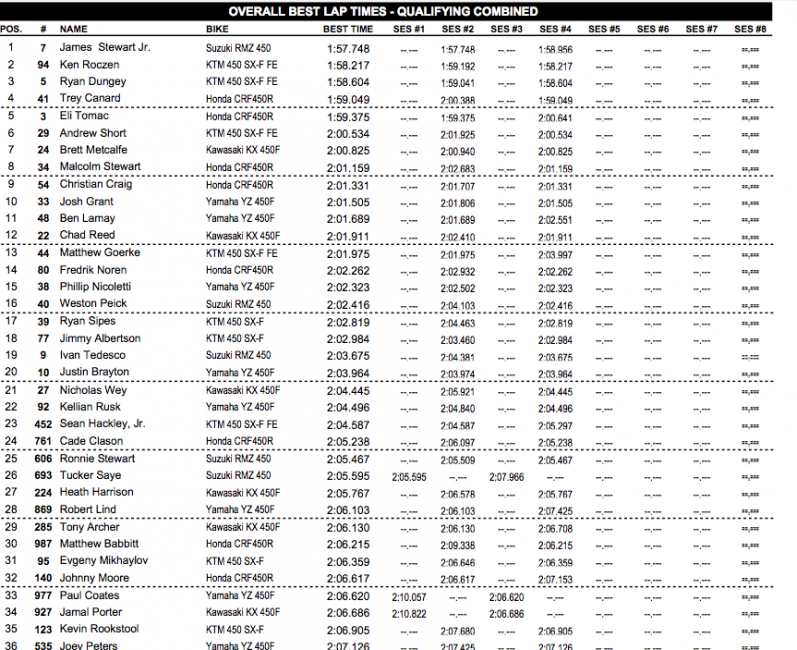 Dungey (1:58.604), Trey Canard (1:59.049), and Eli Tomac (2:00.6410) would round out the top five. RCH/Soaring Eagle Suzuki has Ivan Tedesco back for the first time since High Point. He qualified nineteen this morning. JGR/Toyota Yamaha will have a three-man crew this weekend with the return of Phil Nicoletti. As part of the JGR pilot program, Nicoletti was guaranteed three outdoors, but due to Justin Brayton’s early season injury the team extended it to six. 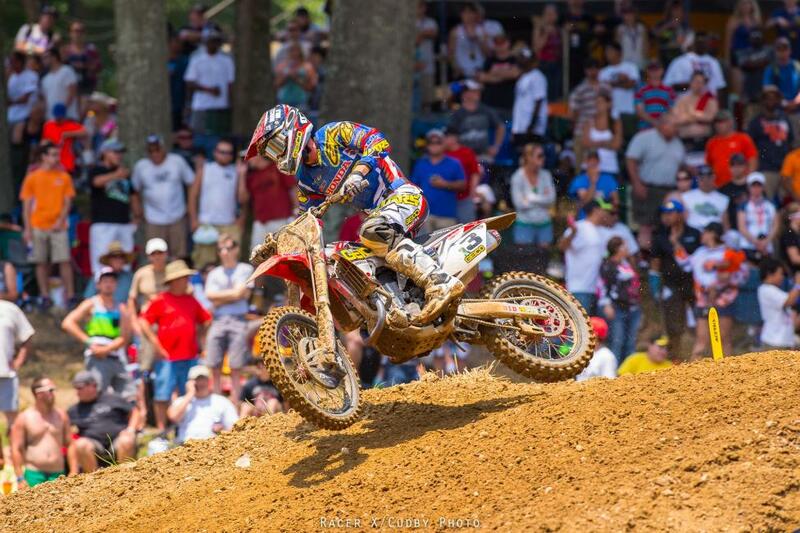 Since he missed RedBud last weekend, Budds Creek is expected to be his last race of the season. We talked to Christophe Pourcel a few weeks back and he told us it was no coincidence that he’s fastest laps came late in the practice—he likes to pick his lines early and then charge late. On cue, Pourcel shot to the top spot late in practice two, and captured the Oakley Bomb Award with a 1:59.331. Jason Anderson, on the heels of last week’s podium, was second with a 2:00.105. 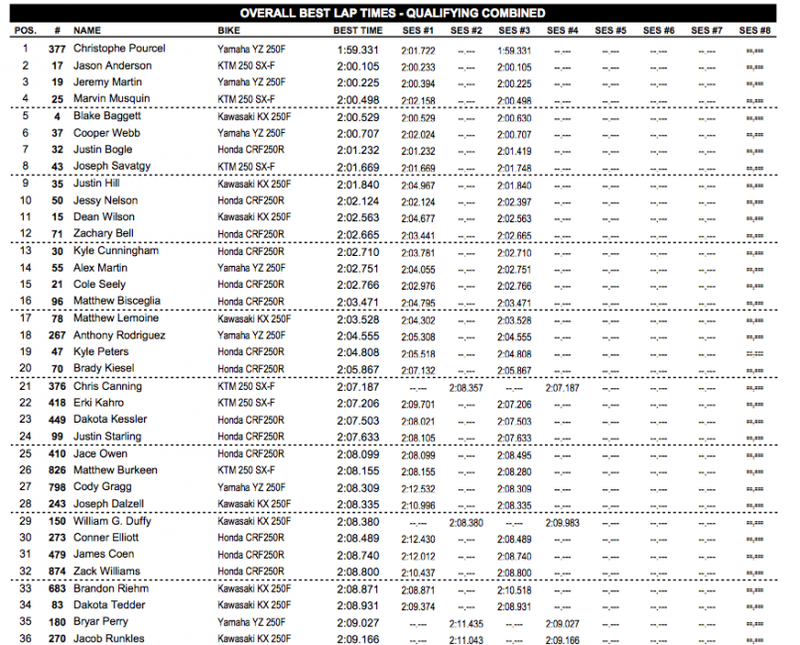 Points leader Jeremy Martin (2:00.225), Marvin Musquin (2:00.498) and Blake Baggett (2:00.529) would round out top five. Two weeks after his foundation was beginning to show cracks, Jeremy Martin rebounded at RedBud. A 1-2 performance from the points leader extended his lead to twenty-three over teammate Cooper Webb and twenty-eight over Blake Baggett. Baggett has won two straight in Southern Maryland and thrives in hot weather. Only three riders in 125/250 Class history have won three in a row at Budds Creek— Steve Lamson ('94-'96), James Stewart ('02-'04) and Ryan Villopoto ('06-'08)—an exclusive club Baggett hopes to join this weekend. The 250 Class has only seen three winners this season (Martin, Webb and Baggett), but have had plenty of company at the top. If practice is an indication, the 250 Class will be closer than ever this weekend.